Hey guys, remember when we talked about The Pursuit of Happyness in April, and asked if wealth actually brings joy? Well hold onto your bucket hats, because today we’re examining the same question through the lens of The Great Gatsby, a tale of the other side of the mirror. Chris Gardner and Jay Gatsby have startlingly similar backgrounds; poor men who struggled their way up to the 1% through hard work and a burning determination. Perfect examples of The American Dream. But while Gardner’s tale seems plausible, Gatsby’s story ventures into the extraordinary — probably because Gatsby is an extraordinary man, according to the narrator Nick Caraway. Gatsby, played the The Greatest Gatsby yet Leonardo DiCaprio, lives some miles outside of New York City in his castle of a mansion. He’s obviously wealthy — just how wealthy no one knows for sure — but his source of income is suspect. Hints show that it could be from bootlegging alcohol, or gang involvement, or both. But though his fabulous life remains somewhat of a mystery, it fits right in with his historical setting. The Roaring Twenties are an entrancing age, especially to today’s harsh economy. We have a morbid fascination watching the top of American society rise to unprecedented success, not knowing that everything will fall harder than they can imagine within a few short years. But judging by the way they live, they seem to consider themselves as untouchable immortals, drinking ambrosia of gold and booze. Going back to the movie’s original context, F. Scott Fitzgerald’s depiction is especially fascinating since he wrote The Great Gatsby during the Jazz Age’s peak. Fitzgerald resembles Caraway; both within and without of American society, able to participate while staying distant enough to see the truth. When he wrote the book in 1925, no one was aware of the impending economic collapse. Yet he hints at such a catastrophe, perhaps prophetically, with his book’s sense of urgency and frustration. And, of course, his social critique of materialism feels like the loud voice of reason that America, preoccupied with enjoying itself, willfully ignores. Images of excess pervade the film. The sheer extravagance both enraptures and alienates the audience. Designers clutter flapper dresses with sequins and crystals, Gatsby’s parties drench guests in confetti and alcohol, and New York’s violent lights never go out. 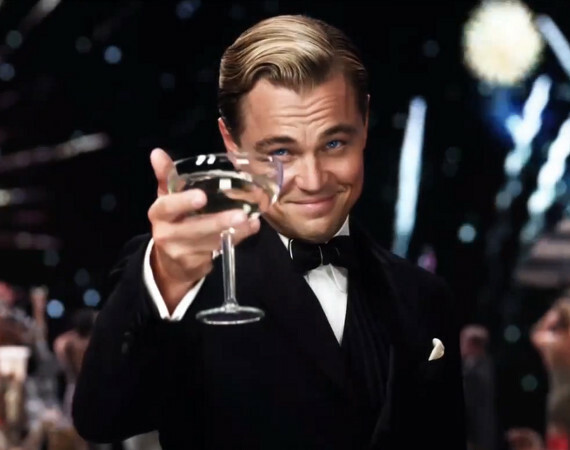 And speaking of Gatsby’s parties, which the whole city attends every weekend, their over-the-top quality perfectly shows the fun but meaningless nature of materialism. There is a zebra in his indoor pool! Nobody needs that! Though its momentarily gratifying, the massive consumerism pressing upon the characters only exacerbates their deep discontent. While all of the characters have their own sources of unhappiness, Gatsby’s ambition and false assumptions drive him to the edge. Nothing is enough for Gatsby. As a poor young man, he wrongly believed that becoming rich would make him happy. Then, after he made his millions and still felt unsatisfied, he went after lost love to redo his disappointing youth. And apparently his attitude was common for the time. Lines taken from Fitzgerald’s other writings describes the movie’s setting well: “The parties were bigger. The pace was faster, the shows were broader, the buildings were higher, the morals were looser, and the liquor was cheaper.” Like his society, Gatsby keeps demanding more and more until, ultimately, it blows up in his face. Set to a wonderful soundtrack that matches the hedonist ethos with a daring mash-up of hip-hop and jazz, Gatsby’s fate shows the problematic side of the American dream just as Gardner’s rise shows its optimistic side. For more analyses on The Great Gatsby, click here for the book and here for the film. Categories: Sustainability & Film | Tags: America 1920s, consumerism, excess, film, Jazz Age, materialism, Scott Fitzgerald, The Great Gatsby | Permalink.